This week marks the start of anti-bullying week. The Anti Bullying Association defines bullying as the repetitive, intentional hurting of one person or group by another person or group, where the relationship involves an imbalance of power. Bullying can be physical, verbal or psychological. It can happen face to face or online. But how often does bullying start with language that some people may think is harmless and just a bit of banter? Especially when it comes to disabled people? Here, Aimee Mann talks about how the everyday use of disablist language in schools, in public and even in people’s homes can have such a negative effect and what we can do when we come across people using that kind of language. I wholeheartedly support anything which works to educate and reduce bullying towards any person or group. I experienced it myself at University and know how harmful it can be. My focus now though, is supporting and sharing the work of organisations who educate individuals, society and educational settings on the effect of disablist language. It is close to my heart as my oldest son, Freddie, has multiple special needs. The Anti Bullying Alliance conducted a poll in 2014 as a result of disabled young people telling the ABA that they heard disablist language being used in school, the media and the wider community. They also said it was rarely challenged. Almost 70% of those teachers had heard children using the words ‘spaz’, ‘spastic’, ‘retard’ or ‘mong’ at school. Over half had heard children using it in ‘casual’ conversation; however the same number heard them using the words as an insult to their peers. 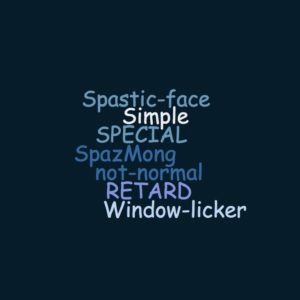 55% of teachers have heard children using the words towards a disabled child /child with special educational needs – with just under half of these using the words to insult them. 1 in 10 adults have used abusive language towards a disabled person. 44% of adults use the words ‘spaz’, ‘spastic’, ‘retard’, or ‘mong’ in casual conversation. 65% heard others using these words in conversation. Most adults were ignorant of the meaning of disablist words. Has much changed since that poll was conducted? I don’t think so. I have personally experienced this on numerous occasions. I’ve heard comments such as, ‘My son got a haircut which made him look special’ or ‘She walks like such a retard.’ Over the years I have become brave enough to tell people that this type of language is not ok. I just explain the reason why. I have never had a negative or aggressive response. It might have been a bit embarrassing for them (and me) but they always apologise and actually most times, it just never crossed their mind it would be offensive. Those words are never uttered in my presence again. I see that as a win, one person at a time. If speaking up educates more people, then I will keep speaking up. I worry all the time that Freddie will be bullied because of his disability but I also worry that my other two neurotypical children will be bullied because of it. I worry how it will make them feel to hear words like ‘special’ and ‘retard’ in the playground. My husband and I work hard to give our children the tools to be resilient, but we can’t be there for every eventuality. I thought perhaps we were some years away from having to deal with the possibility of them hearing derogatory language like this but very recently, I came across parents at their school using disablist language. When I called them out on it, their excuse was that it was private banter (on a public forum) and apparently the term ‘window licker’ isn’t derogatory or offensive to children with special needs. It is the first time I have come across anyone who defended their choice of language and was unwilling to learn and evolve. They were angry I had challenged it, but I know that type of anger and response is usually born out of embarrassment. Although none of my children know this has happened, it raises concerns for me. Concerns that this language is possibly used by parents in the home and my children’s peers are learning this way of talking. They learn that it is ok. In this instance, my speaking up didn’t change the persons thoughts or behavior, but it did spark important conversation around the topic. Worryingly, one of the person’s ‘friends’ commented that as someone who works with children who have special needs, she didn’t think ‘window licker’ was offensive to them. This shocked me more. What often starts out as ‘it’s only banter’ can turn into bullying, either directly or indirectly. Using derogatory language perpetuates the bullying and normalises it. Saying it’s only banter is just passing on responsibility for using derogatory language. BBC Breakfast shared a film about children who attend a Special Needs School and the hate crime they experienced. Their school was targeted, defaced with graffiti and their toys and facilities ruined. The children were interviewed for their response to what had happened. They are an inspiration to everyone. We have come a very long way from the 1500’s when Witch hunts were conducted in Europe. Being disabled or having a disabled child was sometimes used as evidence of being a witch. In 1913, 70,000 disabled people were institutionalised for life and in our very recent history the Nazi ‘Akiton T4’ programme in Germany resulted in the murder of 275,000 disabled adults and children. If you hear this type of derogatory language, I urge everyone to challenge it. Speak up or tell someone in authority if it is happening at school or in the workplace. If you have used this type of language in the past not realising how derogatory it is, take it as your responsibility/duty to be reflective about your own language. About its use and the effects it has on the wider community. When people use the common response of ‘it’s only banter’ it is wholly inappropriate and shows an ignorance of each individual’s role in living/working/being in a community. My big hope for the future is understanding, respect, compassion and inclusion for all individuals. We are all unique and we are all important. A coalition of organisations and individuals working together to stop bullying and create safer environments for children and young people. Part of Family Lives, BullyingUK offers advice and support for young people, parents and schools. Signposts to support for young people being bullied, parent and carers looking for advice and teachers looking for teaching materials around the subject.